On February 22, along with two other co-founders of the West Virginia Mine Wars Museum, I participated in History Day, a yearly event where museums and historical societies from all over the state set up tables in the state capitol. Normally, the cavernous building remains fairly quiet, as legislators walk along chatting, occasionally peeking over their shoulders at our tables. By 10 AM, the hallways were packed and the teachers’ chants were deafening. The 2018 West Virginia teachers’ strike had begun. Katey Lauer, our director, improvised a large sign to tell teachers about our curriculum project for fourth, eighth, and eleventh grade students. Many of the teachers were already wearing red bandannas in remembrance of the 1921 Battle of Blair Mountain, partly thanks to one of our founders, Wilma Steele, a retired Mingo County schoolteacher. For more than a decade, she has been giving red bandannas to people — often young activists — and explaining the history. We had some for sale and offered them to the teachers at half off. Our museum is dedicated to keeping the memory of the West Virginia Mine Wars alive. 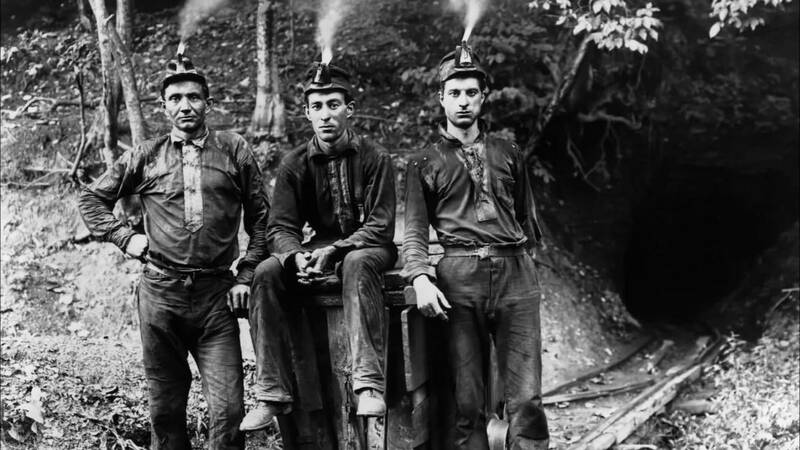 In the early 1900s, miners in southern West Virginia fought a series of bloody battles in hopes of securing the right to unionize. Mine operators were willing to go to extraordinary lengths to prevent their employees from having a say in their wages and working conditions. The Mine Wars were a critical chapter in the history of West Virginia workers and the American labor movement. When the teachers adopted the red bandanna as their symbol, they connected their struggle with the miners’ fight. The militant spirit of West Virginia workers continues — and, as actions in Arizona, Kentucky, New Jersey, and Oklahoma now show, it’s spreading. Coal was the cornerstone of US industrialization, the cheap fuel that kept the blast furnaces lit and the trains running. Until railroad lines cut through southern West Virginia’s mountains, the rugged terrain prevented large-scale mining operations. In 1880, only a few thousand workers dug coal in the Mountain State, but by 1917 some 90,000 miners were pulling 89 million tons of coal a year out of the ground. West Virginia ranked second in coal production, behind only Pennsylvania. All over coal country, hopeful investors opened small operations because, as one claimed, you didn’t need much more than “one mule and a borrowed harness.” The boom produced cutthroat competition, overproduction, wild price fluctuations, and bankruptcies. In 1897, many northern coal operators hoped that standardized wages would bring stability, so they worked with the fledgling United Mine Workers of America (UMWA) to set a standard wage. The agreement based the pay rates on a few mines in Illinois, Indiana, Ohio, and Pennsylvania, but operators in eastern Kentucky and southern West Virginia insisted that they needed lower wages to offset their high transportation costs. To bring these nonunion holdouts into the fold, the UMWA sent Mary “Mother” Jones to the front lines, where she helped miners form UMWA locals along Paint Creek, just twenty miles from the state capital. When the union called a national strike in 1902, mine owners in that area quickly signed, but in the nearby New River Valley, they refused, bringing on armed “mine guards” from the Baldwin-Felts Detective Agency to prevent their workers from organizing. Several gun battles followed. Mother Jones arrived at Stanford Mountain and saw a miner’s wife weeping over her slain husband, his mattress “wet with blood.” In her autobiography, Jones recounts that “[i]n five other shacks, men lay dead.” With this violence, the New River operators broke the strike, setting a terrible precedent. A decade later, West Virginia mine owners again went against their northern counterparts, when Paint Creek operators rejected a five-cent-per-ton wage increase and an eight-hour day for their workers. The miners put down their tools, and Mother Jones returned to organize other workers. The strike quickly spread to nearby Cabin Creek. Though pay and hours certainly motivated the miners, they were most angry that the company had taken away their basic freedoms. Almost all coal miners in West Virginia — 90 percent — lived in company towns, and operators used this system against the union. Owning the workers’ homes and paying them in scrip redeemable only at the company store gave them great power over their workers. Worse, the notorious Baldwin-Felts agents bullied miners and their families and threatened them with violence. Miners evicted because of their union activity moved into canvas tents, and in May 1912, guards fired randomly into the tent colony at Holly Grove. Incredibly, no one was injured, but the miners decided to retaliate, shooting at the guards’ headquarters in the town of Mucklow. The fighting continued, back and forth. A battle on July 26 left a reported six miners and four guards dead, and, in August, Jones exhorted a crowd of striking miners to arm themselves and gather in Charleston to pressure the governor to act. On February 7, 1913, mine guards attacked Holly Grove again. Riding by the camp in an armored train car they dubbed the Bull Moose Special, they fired rifles and a Gatling machine gun into the tents. Cesco Estep emerged from his nearby cabin to yell to his wife to take their baby into the cellar when a bullet tore through his face, killing him. The attack made the front page of newspapers across the country. Governor Henry D. Hatfield, an ally of the mine owners, declared martial law, and the National Guard confiscated weapons and arrested two hundred miners. No mine guards were arrested. Hatfield then brokered a settlement that would allow union organizers in the towns, limit workdays to nine hours, and create a grievance process. But it did not end the mine guard system, give the union recognition, or prevent strike leaders from being blacklisted. Under enormous pressure, UMWA District 17 leaders agreed, sparking anger among the rank and file. Unsatisfied with the union leadership’s deal, miners Frank Keeney and Fred Mooney organized a series of wildcat strikes that forced operators to agree to an arbitration procedure and end the blacklist. The pair were ultimately elected president and secretary-treasurer of District 17. The Paint Creek–Cabin Creek Strike had ended, with ten guards and twelve miners killed in the fighting. West Virginia was a powder keg, waiting for a spark. It came in November 1919. The UMWA won a 14 percent wage increase, and a government study recommended an additional 27 percent to make up for wartime inflation. But Mingo County operators refused to raise wages, and miners began joining the UMWA by the hundreds. Companies once again turned to the Baldwin-Felts Agency for back up. Later that day, Hatfield and Testerman approached the mine guards with an arrest warrant. According to Hatfield, they had a tense exchange, then Felts drew his gun and shot the mayor in the stomach. Hatfield fired back, killing Felts. Shooting from all sides left seven agents and two unarmed miners dead. Mayor Testerman died from his wounds. This street battle became known as the Matewan Massacre. Keeney called a general strike for July 1, 1920, and thousands walked off the job. When the operators brought in nonunion workers to reopen the mines, more violence followed. The governor declared martial law in Mingo County, and a judge issued an injunction prohibiting union members from approaching nonunion miners, let alone the mines. Nearly a year into the strike, the Three Days Battle raged up and down the Tug River. The governor sent 800 special police and 250 civilian deputies to enforce an even stricter martial law, allowing officers to jail any suspicious person. On August 1, Sid Hatfield and his deputy Ed Chambers appeared in court on charges of dynamiting a coal tipple during the battle. As they walked up the courthouse steps with their wives, a group of Baldwin-Felts agents shot and killed both unarmed men. Lively was arrested but released on bail and never convicted. Many coal miners viewed the murder of Sid Hatfield as the last straw. Three weeks later, thousands gathered at Lens Creek, near the town of Marmet. Many veterans wore their old uniforms; all carried rifles and wore red bandannas around their neck as a symbol of solidarity. At a time when many public places in West Virginia were segregated, a quarter of the Red Neck Army, as they called themselves, were African Americans, and many were recent immigrants. In Sharples, they broke into a segregated mess hall and defiantly ate a meal together. The miners set their sights on marching into Mingo County, but they would have to march through Logan County first. There, Sheriff Don Chafin — who earned $30,000 a year from the coal operators — had organized the Logan Defenders. The Red Neck Army planned to defeat Chafin’s army, burn the Logan County courthouse to the ground, march on to Mingo County, free their jailed union brothers, and bring the union to southern West Virginia. Some three thousand Logan Defenders dug in at strategic positions along the twenty-five-mile ridge of Blair Mountain, which separated the union and the nonunion coalfields. They had rifles, .30-caliber machine guns, and Thompson sub-machine guns. Bill Blizzard, a twenty-eight-year-old miner, led the Red Neck Army south. As they marched, thousands more joined, bringing their strength to an estimated ten thousand. The first death came at dawn on August 31, when Reverend John Wilburn, a part-time coal miner and Baptist minister, led a patrol of seventy volunteers up the mountain. Wilburn and his men shot three Logan Defenders, and one returned fire, fatally wounding an African-American miner named Eli Kemp. Wilburn stepped forward and shot the deputy in the head. A column of miners climbed the mountain at Crooked Creek Gap where a notorious Baldwin-Felts agent, Tony Gaujot, pinned them down with machine gun fire. Early Ball, an army vet and a schoolteacher who lived on Hewett Creek, led miners into battle. He later said that if he had had a thousand men, they would have taken the ridge. On Labor Day, after days of exchanging gunfire, the miners moved on Crooked Creek Gap again. One reporter saw two miners get cut down by machine gun fire. Planes flew in low, and an explosion rocked the mountain. Sheriff Chafin had hired pilots to drop homemade bombs on the miners. The secretary of war dispatched one hundred infantrymen to Blair, and Blizzard agreed to a ceasefire. On Sunday, September 4, hundreds of miners surrendered their weapons to the US Army. The largest armed uprising since the Civil War had ended. Five hundred miners — and no Baldwin-Felts agents — were indicted for their roles in the Battle of Blair Mountain, including Keeney, Blizzard, Ball, and Wilburn. Most were charged with treason against the state of West Virginia, but when a jury acquitted Blizzard, prosecutors’ cases started to fall apart. Wilburn and his sons were found guilty of murder and each sentenced to eleven years in prison. Only one miner was found guilty of treason, but after the union posted bond, he left the state and was never heard from again. The strike in the Tug Valley dragged on through the summer of 1922 until the last holdouts in Mingo County voted to end their two-year-long ordeal. Having failed to unionize southern West Virginia, the UMWA lost the support of northern operators. Its membership declined from 600,000 in 1923 to 200,000 by the end of the decade. West Virginia miners continued to live in company towns, earn low wages, and work in deadly conditions, but they kept the memory of Blair Mountain close. Lou Martin is a founder and board member of the West Virginia Mine Wars Museum and an associate professor of history at Chatham University. He is the author of Smokestacks in the Hills: Rural-Industrial Workers in West Virginia .